The SCP SCIENCE SP-2000 Swing Mill Grinder provides fast, efficient, reproducible grinding of wet or dry production samples, minerals, ore, rock, cement, brick, slag, coke, and similar materials. 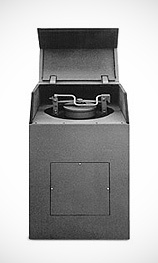 Flexibility in sample volume and type are provided by choosing the appropriate grinding dish for your application. The addition of a triple-head Adapter Plate allows three separate 20 or 50 ml grinding dishes to be used simultaneously.